This news item was posted in Brain, Mental health, Nervous, O category and has 1 Comment so far. Symptoms vary with the specific disease. 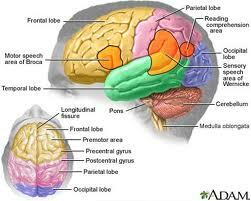 In general, organic brain syndromes cause varying extent of confusion, delirium (severe, short term losses of brain function), agitation, and dementia (long-term, often progressive, losses of brain function). Organic brain syndrome associated with consumption of drugs. Organic brain syndrome (OBS) is a common “diagnosis” of the elderly. It is not an inevitable part of aging, however. OBS is not a separate disease entity, but is a general term used to categorize physical conditions that can cause mental changes. Other conditions that may be related to organic brain syndrome include depression, neuroses, and psychoses of various types, which may occur simultaneously with the OBS. It is not an inevitable part of aging, however. OBS is not a separate disease entity, but is a general term used to categorize physical conditions that can cause mental changes. Treatment varies with the specific disorder. Many of the disorders have nonspecific treatments, primarily supportive care to assist the person in areas where brain function is lost. Medications may be needed to reduce aggressive behaviors typical of some of the conditions in this category.